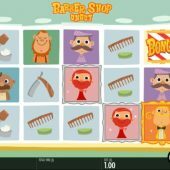 Barber Shop Uncut is a great improvement on the original Thunderkick Barber Shop slot as far as I can see. You get more pay lines, huge hit potential and a generous base game mechanic to extend your session as you will see shortly. We don't deviate from the original cartoon graphics of various characters in need of trip to our resident French barber and the format is the same. Like Netent's Jack Hammer slot you land a win and it freezes while the rest of the non-winning symbols spin until no more winning lines are added. So will Barber Shop Uncut grow your balance or shave it to the bone? There are 40 pay lines over a 5x3 grid and we immediately hear the stereotyped French accordion music as the reels spin and a blast of the harmonica when wins appear and the re-spins start. You don't get Wild symbols and all 15 icons spin as individual reels as is necessary for this format. 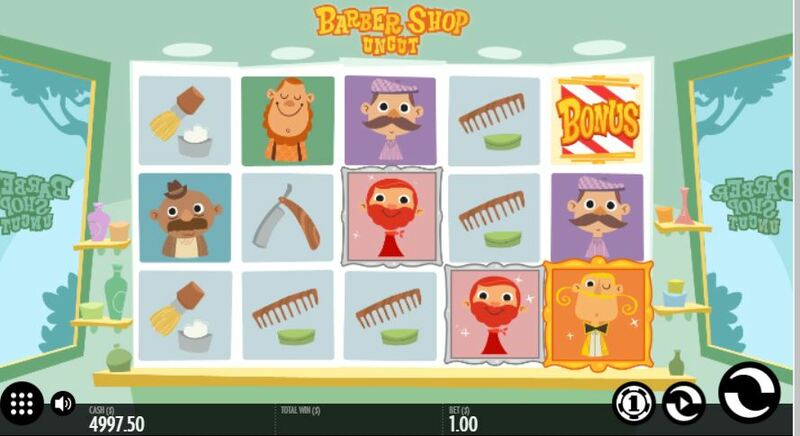 The blonde man is top pay at 15x bet for a 5-of-a-kind win followed by Mr. Redbeard at 10x, the purple character at 5x, Mr. Orangebeard at 4x and finally the bald man at 3.5x bet for the 5. You don't get card values but instead there are various tools of the trade such as scissors, cut-throat razor, foam and comb paying 2 down to 1x stake. Any single win of 3 tiles or more will hold while the remaining positions spin until no more winning icons are added, but this can also apply if you happen to land 2 different winning icons on different lines. There is a bonus icon too which triggers the free games round, usually a generous feature! If you land 3 or more bonus symbols the reels will do their usual and re-spin until no further icons appear. You need 5 or more for the free games of which you receive 10. If you get more than 5 before no further ones appear, 2 spins are added for each one so you could theoretically get a maximum of 30 if you filled all 15 positions with them. The spins are played at 3x multiplier with no retrigger possible and your final spin will be what Thunderkick call an 'Inwinity Spin' whereby the spins will continue infinitely until a win appears and the re-spins begin for it. On the original version this last spin was simply a 5x multiplier one.